Is parcel delivery a problem in your office? MYPUP and Nott Office are collaborating to bring a unique service to London offices and apartments to help ease their flow of parcels. Rather than having all parcels delivered to reception or security (which takes up so much time and resources). 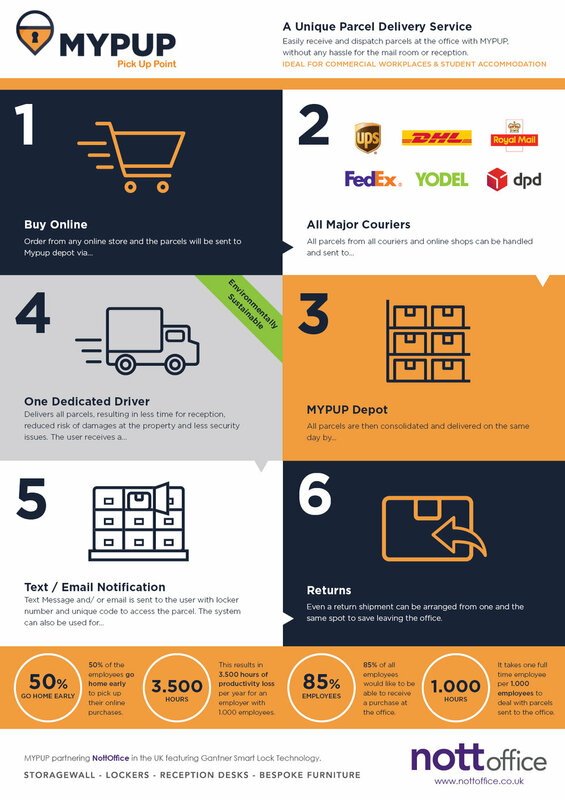 Have all parcels delivered to a MYPUP Hub and all packages are then delivered to the office on the same day by one courier. Parcels are placed into a pick up point locker system. A notification via email or text with a unique access code is sent to the user where they can obtain their item/s. Returns can also be managed the same way! We have just manufactured and installed these built in lockers. The client requested for a mixture of door sizes to cater for various staff needs. Doors were sprayed in corporate orange colours. A manual combination lock was requested to allow the staff to have more flexibility and security. Please take a look at our latest showcase video of our furniture project for a Kent based insurance company. Including special finishes, breakout furniture, planters and personal lockers. Here is a recent design concept for a client with a bespoke upholstered seating alcove and built in table. Ideal for creating a welcoming yet usable reception area or for a contemporary informal break out area. We are very proud of our most recent installation. Over 100 locker doors were provided with electronic locks and various coloured doors. All was manufactured and installed within 4 weeks. Storage needn’t be boring. Use customisable graphics to create an inspirational and striking working environment. Motivate and inspire the workforce with an unlimited range of stunning graphics on storagewall units. 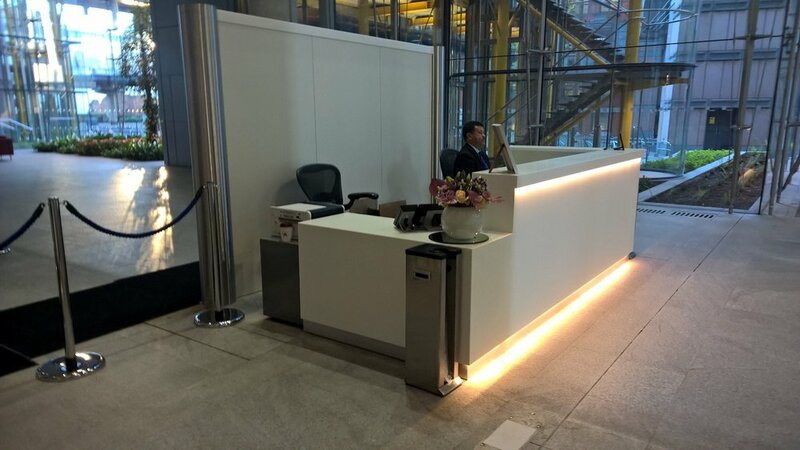 Nott Office were awarded the contract to manufacture and install a reception counter for a popular spa in Essex on behalf of a local office furniture dealer. The reception was constructed using a highly detailed wood replica laminate for its curved base with matching bespoke full height towel storage unit. LED lights were fitted to the recessed plinth as a highlighting feature. Shaped Corian with a stone-like grain was used as a worktop, ideal for the high traffic & client facing greeting point. Let us know if you like the end result and feel free to contact us if you would like us to quote on your next project. Yes thats right! We have just installed 24 bays of built in storagewall within 2 weeks of receiving an order from one of our fit-out dealer partners. A mixture of full height and low level were supplied, all in our standard brilliant white finish with graphite internals. If you are working on a project and worried about lead time please ask and we will see what we can do! 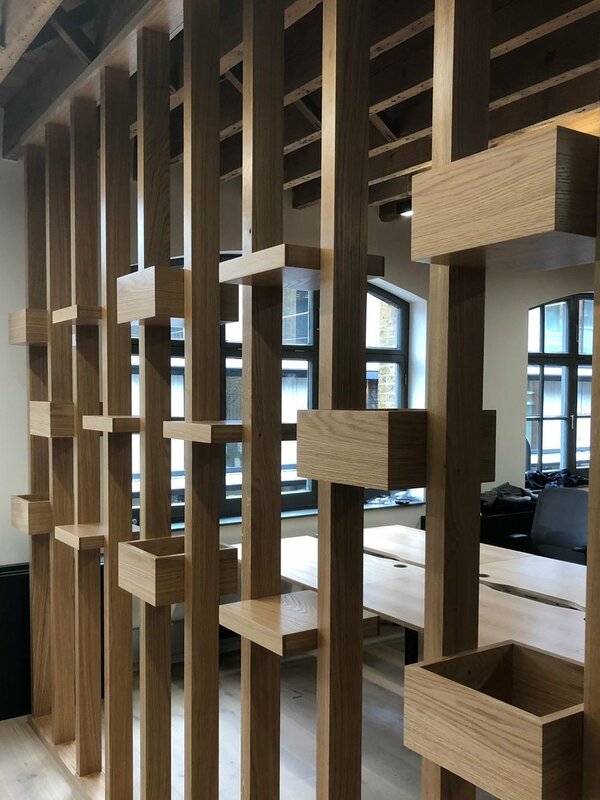 At Nott Office, we have helped to design and manufacture many bespoke pieces of furniture that make use of the wide variety of Resin Solid Surfaces currently available. These have included such well-known brands as Corian, Avonite, Himacs, Krion and Hanex. Our furniture that has proudly featured Solid Surfaces include stunning Reception Counters and multi-purpose Work Surfaces, both of which are commonly used in commercial premises, such as offices, hotels, leisure, healthcare and restaurants, and which bear testament to their robustness and visual appeal. Solid Surfaces are often used as replacements for granite and stone. This is because they can be formed, repaired and polished, and also because they are highly resistant to fire, can endure extremes of weather and boast seamless joints for maximum visual appeal. Take a look at some recent projects involving Resin Solid Surfaces. Seamless/invisible joints - sheets and sections can be bonded together using chemical welding kits. This guarantees an uninterrupted continuity of the surface’s physical and chemical properties within each item’s joints. Highly resistant to fire - Resin Solid Surfaces are considered to be virtually fireproof, as the material does not allow fire to spread. Resistant to sunlight - proven to be extraordinarily resistant to the deterioration caused by UV radiation. Resistant to extreme environments – Solid Surfaces are capable of withstanding extreme conditions, such as those found in marine environments or where there is exposure to steam, immersion in water or freezing conditions, and many others. Sustainability - the majority of Solid Surfaces are 100% recyclable. Highly resistant to chemical attack - the material’s resistance to chemical attack makes it ideal for use in laboratories and other professional facilities, as well as for use in any type of application where it’s necessary to return the surface to its original condition simply and effortlessly. Easy to clean- Any normal stain, superficial burn, graffiti or marker pen stain can be removed from a Solid Surface. The surface is immediately returned to its original appearance simply by following the recommended cleaning instructions. Food grade - Solid Surfaces are a food-grade product that meets both US and European standards. This means it can be used in any environment where there is contact with foodstuffs. Colours – Each Solid Surfaces range is available in any one of more than a hundred colours and this includes flecks and stone replication. Special or corporate colours can also be created for projects that exceed the minimum quantities required. Backlighting – Solid Surfaces can be used to create backlit spaces. It is possible to create spectacular lighting effects by combining different thicknesses of the material. Hygienic - We recommend KRION™ surfaces, which don’t allow the growth or spread of bacteria and fungi. This is an intrinsic and permanent property of the material’s composition, achieved without the need for additives, which makes it an ideal material for locations that have demanding hygiene and sanitation requirements, such as operating theatres or clean rooms.